Ice cream in France is generally as good as you will find anywhere in the world. Many French ice cream parlors will offer you the choice of an ice cream cone or ice cream sundae made with their very own ice cream freshly made on the premises. 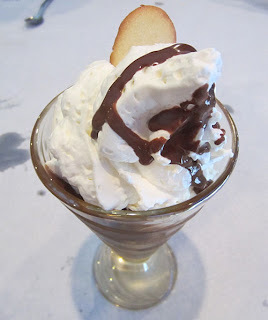 Chocolat Liegeois - made with chocolate ice cream, chocolate sauce and chantilly (sweet whipped cream) and served with a thin, sweet biscuit. 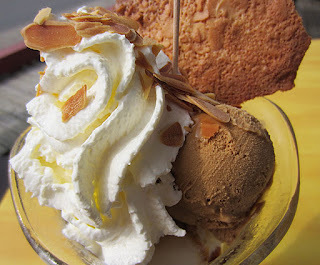 Cafe Liegeois - made with coffee ice cream, sweetened coffee and chantilly, served with a thin, sweet biscuit. My husband and son were kind enough to volunteer to eat one each just so that I could photograph them for my ice cream blog readers .... and here are the photographs to prove it! I hope to be sharing a little ice cream with my family today as we have a very special celebration - our son's 21st birthday. Born on Rememberance Sunday, he is a constant reminder of all that's good in life. Despite long-term, debiliating health problems, he shows a level of courage and determination that touches all who know him. How appropriate it is therefore that today should be a special number ..... 11.11.11.